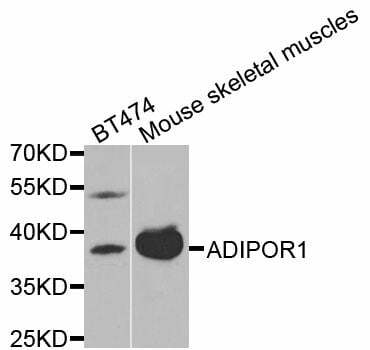 Small volumes of anti-ADIPOR1 antibody vial(s) may occasionally become entrapped in the seal of the product vial during shipment and storage. If necessary, briefly centrifuge the vial on a tabletop centrifuge to dislodge any liquid in the container`s cap. Certain products may require to ship with dry ice and additional dry ice fee may apply. Western blot analysis of extracts of various cell lines, using ADIPOR1 antibody at 1:1000 dilution. 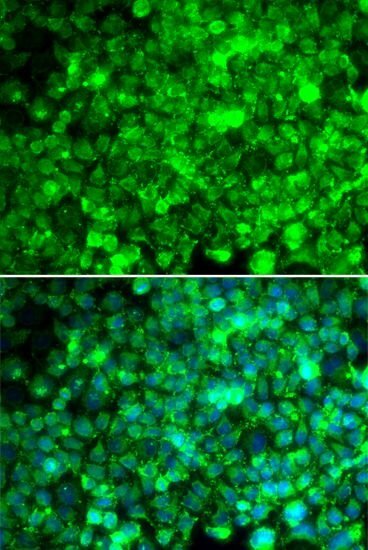 Immunofluorescence analysis of U2OS cells using ADIPOR1 antibody. Blue: DAPI for nuclear staining. NCBI/Uniprot data below describe general gene information for ADIPOR1. It may not necessarily be applicable to this product. ADIPOR1: Receptor for globular and full-length adiponectin (APM1), an essential hormone secreted by adipocytes that acts as an antidiabetic. Probably involved in metabolic pathways that regulate lipid metabolism such as fatty acid oxidation. Mediates increased AMPK, PPARA ligand activity, fatty acid oxidation and glucose uptake by adiponectin. Has some high-affinity receptor for globular adiponectin but low-affinity receptor for full-length adiponectin. Belongs to the ADIPOR family. 1. AdipoR1 stimulates IL10 production by activating the AMPK and MAPKp38 pathways, whereas AdipoR2 modifies inflammatory processes by activating the COX-2 and PPARG pathways.